On 17th January, Shelter Associates gave a presentation in the community of Shivrai Nagar to tell residents more about their work, and celebrate the completion of 105 individual toilets in the settlement. Shivrai Nagar is one of a number of unregistered slums in the Bibewadi area of Pune, where residents lack access to basic facilities such as clean water, waste disposal and sanitation. Lack of toilet provision was a pressing problem, with over 2000 people forced to defecate in open space prior to Shelter Associates’ involvement. The presentation was well attended by community members, along with representatives from our partners Swadhar; Friends of Shelter Associates (FSA); and the Municipal Corporation. Sunil Bhatia, the founder of FSA, had travelled to Pune from the US to visit. His charity raised 40,000 USD towards the individual toilet project, in which toilets were provided to families on a cost-sharing basis. The presentation began with an introduction from Angali Bapat, of the NGO Swardhar, who first invited Shelter Associates into the settlement. Then it was the turn of Shelter Associates community workers, who explained the project in more detail. They used aerial photographs and coloured plans to display their survey information in a way that was easy for everyone to understand. They also showed photographs of the terrible garbage situation in the settlement before the clean up – accompanied by peals of laughter from those who had forgotten how shocking the situation had been only a short time ago. The most memorable moment of the day was when community members stood up to tell their own stories. These personal responses to the project were not scripted and gave a powerful illustration of the difference a toilet had made for individual families. Despite the celebrations, work in Shivrai Nagar is far from over. Shelter Associates is working to extend individual toilet provision within the settlement and to the surrounding areas, where the sanitation situation is acute. Survey work is currently underway in some of these neighbouring communities. Visit the press section of our website to read articles about the event from Indian Express, Sakal and Lokamat. Volunteer Miles Phillips has made two new videos about our recent work, which are now available on the Shelter Associates’ YouTube channel. Smokeless Cooking Stoves (Chullahs), developed by the Appropriate Rural Technology Institute (ARTI), have been provided free of charge by Shelter Associates to some of the poorest families. Children’s Workshops to teach slum children about environmental responsibility, have been taking place since March 2010. Take a look at our previous posts for a more information. 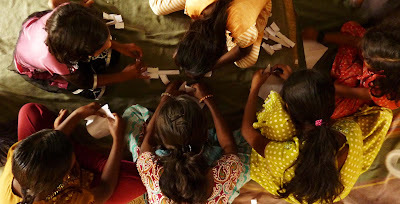 Shelter Associates has been running a series of workshops for children in the slums of Sangli. They are targeted at 10 and 12 year-olds, whose families will soon be relocated under the Government of India’s JNNURMscheme. The workshops take place in a fun and informal atmosphere, where the children have the chance to get to know their new neighbours and learn about their role as future caretakers of their environment. Following a series of six introductory ‘ice-breaking’ workshops, there will be further sessions on Health & Nutrition, Water, and Sanitation & Waste. In collaboration with NiBo, Shelter Associates & nbsp conducted a two-day workshop for children on August 21st and August 22nd. The workshop covered 8 slums in the cities of Sangli, Miraj, Kupwad (all three of which form a municipal corporation). 80 children between the ages of 10 and 12 participated. 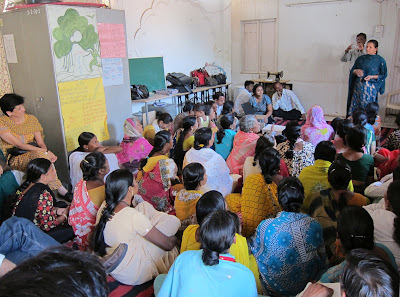 This workshop is the first in a series that is being planned for the slum kids of Sangli and the surrounding areas who are part of the IHSDP (Integrated Housing and Slum Development Programme) portion of the JNNURM (Jawaharlal Nehru National Urban Renewal Mission) program of the Government of India. There are 29 slums covering almost 3800 families that will be relocated as part of this project. Shelter Associates believes that these children are the future caretakers of their new environment. Any efforts made at this tender and impressionable age to teach them about environmental issues will help in building a sense of responsibility towards the upkeep of their new homes and environment. The workshops aim to impart learning through fun and games in an informal atmosphere. The themes will tackle health and hygiene and other environmental related issues. Each group will be taken through 6 workshops over the next 5 months.